Braising is a terrific slow cooking process for transforming a tougher, oftentimes cheaper, cut of meat into fall-apart tender goodness. Gently simmering the meat in liquid allows it to tenderized while rich flavors develop. 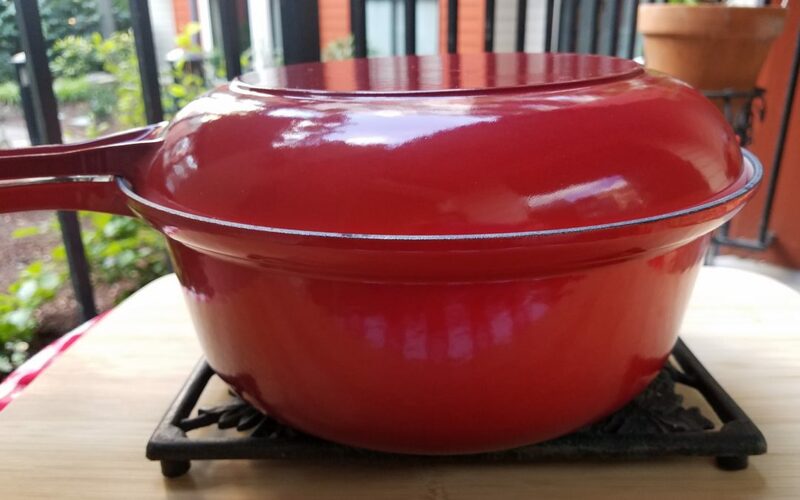 Braising can be done on the stove top or in the oven, and using a deep, heavy pot with a well-fitting cover, such as a Dutch Oven, is best. Braising is an easy process to learn and one that can really benefit home cooks. Once the preparation steps are complete, it’s a fairly hands-off cooking situation. Cooking time will vary based on the type and size of meat used and the cue that it’s done is not internal temperature but fork tenderness. If braising in the oven, preheat to 300° or 325°F. Otherwise, use the stovetop. Mince 1 – 2 cloves garlic; set aside. Measure herbs – ¼ – ½ cup fresh herbs of your choice or 1 teaspoon dried herbs + 1 bay leaf; set aside. In a Dutch Oven, heat 2 tablespoons of olive, coconut or avocado oil over medium heat. Sprinkle salt and pepper on the meat on both sides. Add the meat to the pan and allow to brown for about 3 – 5 minutes per side. Remove meat from pan and place on a plate or platter temporarily. Use this same pan for step 3. Add 1 tablespoon additional oil to the pan, if needed. Add the onion, carrot, and celery to the pan; saute until soft and lightly brown. Add garlic, another light sprinkle of salt and pepper, and saute for 30 seconds. Add ¼ – ½ cup of wine, vinegar, apple or cranberry juice, beer, stock or water to the pan. Scrape the bottom to loosen the browned bits. These will add more flavor and richness to the final dish. Add the herbs over the top of the vegetables. Place the browned meat on top of the herbs and veggies. Add liquid of your choice for braising – stock, wine, juice, beer or a combination work well. Pour enough liquid to come up half way on the side of the meat. Cover tightly and allow to simmer gently over low heat on the stovetop or in a 300° to 325° oven. Timing will vary greatly depending on the type and size of meat used. Meat is done when it is fork tender. Check it occasionally for doneness. Generally, chicken thighs take approximately 45 – 60 minutes; beef, lamb or pork take approximately 1 – 3 hours. As a bonus – any remaining braising liquid can make a wonderful sauce to serve with the meat. Simply transfer the meat to a serving plate or platter, cover with foil and allow to rest a few minutes. If there is a lot of liquid in the pan, bring it to a boil over medium-high heat and allow it to cook down and thicken slightly – enough to lightly coat the back of a wooden spoon. Or, a thickener can be stirred in, such as a small amount of corn starch, cream, coconut milk, or cold butter. If only a small amount of liquid is left in the pan, add some stock to make about 2 cups liquid. Bring to a gentle boil and either cook down to thicken slightly or use a thickener as suggested above. Taste the sauce and add a bit more salt and pepper if needed or a splash of balsamic vinegar or lemon juice to brighten it up. Slice the meat, transfer sauce to a serving bowl, serve and enjoy! The process is similar to braising meat, except the vegetables are not browned prior to braising. For instructions, check out “How to Braise Vegetables for Deeper, Richer Flavor” from the Chicago Tribune, or “How to Braise Vegetables” from William Sonoma Taste. Braising is a terrific slow cooking process for transforming a tougher, oftentimes cheaper, cut of meat into fall-apart tender goodness.